Listen in as we review the new films Snowtime, Zoolander 2 and the MacGillivray/Freeman IMAX documentary, National Parks Adventure. And, we will share with you our conversations with the Grammy nominees for Children’s Music. “Breakfast Club” from Tim Kubart’s award-winning CD “Home” available at TimKubart.com. Hosts Keefer Blakeslee and Gerry Orz are joined by KIDS FIRST! Film Critic Samantha, Morgan and Lainey. Remember, before you spend your hard earned dollars at the movies, be sure to listen to what our youth reporters have to say about them. Hail, Caesar!, The 5th Wave, The Good Dinosaur, National Parks Adventure. Listen in as we review Hail, Caesar, The 5th Wave, The Good Dinosaur and National Parks Adventure. Hosts Brianna, Lainey, Keefer and Gerry are joined by KIDS FIRST! reporters Benjamin P. and Samantha A. in this week’s show. Before you spend your hard-earned dollars at the movies, be sure to listen to what our youth reporters have to say. 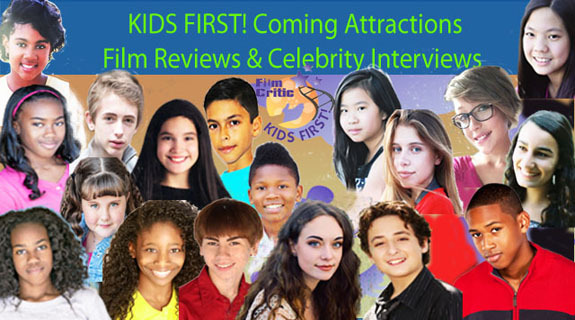 Posted in KIDS FIRST RADIO | Comments Off on Hail, Caesar!, The 5th Wave, The Good Dinosaur, National Parks Adventure. Listen in as we review Kung Fu Panda 3, The Finest Hours and The Good Dinosaur which comes out on Blu-Ray/Digital HD later this month. In honor of President’s Day, we interviewed Grammy nominated, award-winning musician Jonathan Sprout about his CD American Heroes #4. Host Keefer Blakeslee is joined by KIDS FIRST! reporters Na’im, Nathaniel, Lainey and Samantha. Before you spend your hard earned money at the movies, be sure to listen to what our youth reporters have to say. Listen in as we review the latest installment to your favorite Jack Black series, Kung Fu Panda 3, the true life story film, The Finest Hour and The 5th Wave. Hosts Morgan Bertsch and Brianna Hope Beaton are joined by KIDS FIRST! Film Critics Benjamin, Abigail, Clayton, Tre’ana, Lainey and Harmony. Before you go spend your hard earned money at the movies, be sure to listen to what our youth critics have to say. You are currently browsing the KIDS FIRST! Radio weblog archives for February, 2016.